The Werewolf guild rank is for characters who raid regularly with the guild. Any character that has already reached the Wolf/Wolf Alt rank is eligible to be placed into the Werewolf rank. Anyone below that rank, who raids, will need to gain the Wolf/Wolf Alt rank before they can be placed in the Werewolf rank. The Werewolf rank is a privilege, NOT a right, for raiders and is on a "per character" basis. The difference between the Werewolf rank and the Wolf/Wolf Alt rank is simply access to raider buff foods/potions/flasks in the guild vault, and a slightly higher amount set aside for their repair bills. Characters will be promoted to the Werewolf rank at the discretion of the Guild Leader and will be based upon *regular attendance to raids with that character, whilst "pulling your weight" ... ie, a member who would otherwise qualify to be in the Werewolf rank, attends raids, but is consistently a poor performer, would not necessarily be invited into the Werewolf rank. *Regular means simply that you attend/sign up for raids, when you are able. Obviously if you sign up, and are available, for every single raid, then you are more likely to quickly be invited into the Werewolf rank, however, we understand that it is not possible to always be available for raids, or that you don't always wish to attend raids - this will not exclude you from the Werewolf rank. Being in the Werewolf rank does not guarantee anyone in that rank a raid place, nor does it give them priority over anyone else in the guild, in different ranks, who wish to attend. Being in the Werewolf rank is not a lifetime commitment - if someone no longer wishes to raid, they can be placed back in the Wolf/Wolf Alt rank. When a new level cap arrives with a new expansion, and raiding stops for a while, all characters in the Werewolf rank will be placed back at the Wolf/Wolf Alt ranks until raiding starts again, at which point selection will start again. Some raids can only be entered in the calendar and organised by raid organisers, these are classed as "restricted raids". The raid organisers are currently designated as being the guild leader and the officers, and in certain circumstances any other member of the guild previously given permission by an officer/guild leader. Should anyone other than these designated organisers make an entry for a restricted raid, they will be requested to remove it. Members of the guild may pug, or semi-pug ANY raid, however, if they wish to join an organised guild run they must ensure the character they intend to sign up with is reserved for that purpose. Please try to be aware of what classes/specs are likely to be doing the same as you! (You may still run a "Looking for Raid" during a week where you wish to attend a guild raid as this does not "lock you out" of a guild raid). As a quick explanation of the above: The current raid "lockout" system means that any character can only gain standard loot (ie, not including bonus roll loot) once per boss, per difficulty level, per raid week. A raid week is Wednesday to Wednesday, ie, raids reset early on a Wednesday morning. This means that, if you kill a specific boss at a specific difficulty level in a pug group, and then want to join a guild raid to kill the same boss, at the same difficulty level, in the same raid week, you will be unable to gain any additional standard loot. Most people would not want to attend a raid to kill a boss with no chance of standard loot, therefore we ask that people do not put themselves in that situation. If you are happy being in this situation, then that is fine. Raid Organisers do not have to attend, or be raid leaders, but they do select who attends, in which role. The Raid Organisers choice of attendees is final (subject to discussion with the Raid Leader if necessary), and is always made for the good of the raid group. Should you disagree with the Raid Organiser, please feel free to put forward your reasons, however, "because I went last time", or "because I put my name down before X" aren't good reasons. A raid group has to be balanced carefully taking into account classes and specs attending, the balance between melee and ranged, any specific fight and/or buff requirements, knowledge of fights, ability of members to quickly learn and adjust to new fights and new situations, ability of members to work as a team and, most importantly, the ability of a member to know how to stay alive. Raid Leaders can be anyone selected by the Raid Organiser, and doesn't necessarily need to also be the Loot Master. The Raid Leader or Raid Organiser may choose a Loot Master. A Raid Leader should have all relevant addons necessary in order to track the raid progress (or ensure a member of the raid group has them). A Raid Leader should be prepared to give direction, explanation of tactics, take advice when necessary and calmly assess any progress or lack thereof. A Loot Master should be someone who is aware of the differences between DPS, healer and tank loot, and be fully aware of our loot distribution rules. When loot drops, the Loot Master should ask in raid for "need" rolls first and then, if no rolls are made, ask for "greed". The Loot Master should be aware of who has rolled, who should and shouldn't be rolling for specific loot and give warning when a loot decision is about to be made (ie, by stating something like "closing in 5..."). Raid Members should come to raids well prepared with all flasks, foods, potions, etc. They should have all of their gear enchanted and gemmed up and they should have researched or already know the tactics for the versions of the raid/boss(es) planned (either by using the links on this website to the various guides and/or looking up strategy guides/videos on the many available resources available such as youtube, icy veins, tankspot, etc). At relevant times during a raid (during breaks, prior to fights, after a wipe, etc), the Raid Leader may ask for input to help the raid's approach to the fight. If a raid member wishes to contribute, they should do so in a calm, well structured manner and be prepared to back up their information with website links. If a Raid Member is finding it difficult to gain the attention of the Raid Leader over voice chat (as occasionally at these times it is difficult to know when a break in conversation may occur), they should type in raid chat that they have something to contribute. The Raid Leader will then ensure that Member has time to put their opinion to the group over voice chat. Complaints: should there be a complaint regarding the raid, or raid group, or member of the raid group, the raid leader should be informed via /w. If the complaint is regarding a raid member, the complainant should also speak to the offending member. If the complainant does not feel that the matter has been resolved, they should (a) ensure they have explained fully the problem, (b) confirm what action, if any, the Raid Leader has undertaken, (c) explain to the Raid Leader that the complainant does not feel a resolution has been reached, and then (d) approach the Guild Leader. If necessary, please be ready to provide screenshots of any offending behaviour. We arrange and run raids for the members of the guild only. 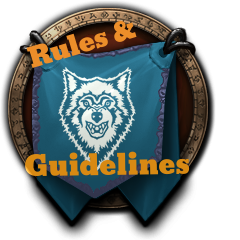 On occasion we may allow a current guild member to bring one of their own characters that isn't currently in the guild, but we do not generally allow non-guild members to join. If a non-guild member is considering joining our guild, and wishes to experience our raid environment first prior to making that decision. This should be arranged with the guild leader prior to a raid, to establish which would be the best evening for them to come along. Close to the end of the expansion, if raids are opened up to non-guild members. This will be announced both on the website and in-guild prior to any raids being organised. If an "official" arrangement has been made with another guild which involves us teaming up to run through a raid. This will be announced in plenty of time both on the website and in-guild. PLEASE NOTE: Server Time is affected by Daylight Saving adjustments .. meaning that if you are somewhere that does NOT change their clocks twice a year, these times will change for you by an hour twice a year. The onus is upon you to work out how this affects you, and if you'd still be able/willing to attend raids following the time adjustments. If you sign up to attend a raid, you should be there prior to raid start time and attend throughout raid time, until the end. Should you be unable to adhere to this, but still want to join a raid group (for example if you need to leave early, or need to start a bit later) please discuss with the raid organiser/raid leader PRIOR to signing up. Depending on your role and number of people attending, we are sometimes able to be flexible. Some addons are a must in our raid environment. These generally include a Boss Mods addon, but some additional addons may be required depending on your class - such as Decursive. Please ask in guild for further advice. In addition to these addons, Teamspeak is required during guild raids. At a minimum raid members are expected to load up and listen to voice chat, but ideally we would expect members to be able to speak as well. Preference will be given to players who have signed up. In the majority of cases, acceptance into a raid group will be based on when you sign up - those who sign up sooner will get picked before those who sign up last minute. Raids take a lot of time and effort to organise and we cannot leave acceptances to the last minute just to enable us to pick and choose who goes. If you are regularly unable to confirm you can raid until close to raid time, but would like to sign up, please speak to the raid organiser who may be able to occasionally make an exception. Depending on numbers of certain roles, we sometimes have a rota in place so that everyone who wants to raid in a specific role gets that opportunity. This does mean that, on occasion, those whose turn it is NOT to raid in their preferred role will either have to sit out or play a different role. All sign-ups will be manually accepted/put on standby. Please check the Calendar for updates as to your raid status. If you can, please sign up with the character you wish to take, however, please only sign with one character (some of us get confused and accidentally sign up people on several alts!). If you are happy to help with another character, just let the raid organiser know. Alternatively, if you have several raid ready characters but only wish to raid on specific ones, or in specific roles, please let the organiser know. If you would like to attend a raid, but are unsure if you will be able to be present at the raid start time, please sign up as "tentative". Members who sign up as available will have priority to be picked over those signed up as tentative. If your circumstances change and you know you will be able to attend, please change your status from tentative to available. You must only sign as definite if you know you will be able to attend the raid for the full duration and fulfil any raid requirements (such as output/gear level). If you sign as definite, regardless of whether you are accepted or placed on standby, you MUST be online and ready for invites prior to raid start time AND, IF ON STANDBY, REMAIN ONLINE UNTIL YOU KNOW THERE IS NO FURTHER SPACE IN THE RAID FOR YOU. Signing up as definite is your promise to us that you will be online and ready for invites - signing up and not turning up, without prior notification, will be noted. If you sign up as definite but then you are unable to attend, please change your status on the calendar and notify the raid organiser. If you wish to raid but don't quite meet the requirements, or you can't attend for the entire duration, or you aren't sure if you'll be online, please sign as tentative. If there are spaces in the raid at raid start time, and no more available from the standby list, those on tentative can request to join. Inclusion in one raid does not guarantee you a place in any continuation raids, although preference may be given, assuming your gear/dps/abilities are viable and your past attendance record is good. If you are multi-specced and wish to only be considered for one role, please let the Raid Organiser know - otherwise please be prepared to attend as whatever is needed. As we are a casual guild, we will try to accommodate any role/class preferences, however this will depend on who else is available to raid, and what bosses we are intending to raid. Please note .. it is NOT acceptable to complain that you never get picked, if you never put your name down/always put your name down last minute! It is also NOT acceptable to complain that you never get to fulfil a particular role, if you haven't specifically indicated a preference! Please ensure you are not "locked" out of the instance/encounter prior to putting you name down. If you need/want to leave at a particular time please let the raid leader know before start. Most raids will usually start between 9-9.30 server time and finish between 12:00 midnight - 1:00 am server time. Server time is GMT+1. Please ensure you know the start time and be online by that time at the very latest (unless otherwise arranged with the raid leader). If absent during raid setup you will probably lose your place, and could possibly cause the entire raid to be cancelled. Guild members who regularly fail to attend raids they have signed up for are much less likely to get picked for future raids. Make sure that you have necessary buff foods, potions, flasks and reagents prior to raid start time. If you find yourself "short" of something and another raid/party member provides extras (flasks, potions, etc), please ensure you return these to the lender as soon as possible after the instance run. Loot is usually dealt with using the "Personal Loot" system. This means that any loot you find is yours and personal to you. If you gain loot that is transferrable to another member of the raid group (either Bind on Equip (BoE) or transferrable Personal Loot) then you have the choice of either keeping it or donating it. If you chose to donate it, it should be passed to the Loot Master (the raid leader unless otherwise stated), at which point it will be open for Need/Greed rolls from the raid group as per the Master Loot System (see below for an explanation of Need/Greed). BoE loot will be placed in the Guild Vault. Non-BoE loot will be disenchanted if possible, or sold. The resultant materials/funds will be added to the guild vault. Occasionally we may use the "Master Looter" system. If we decide to use the Master Loot system, it will be discussed prior to the loot method changing. Any loot on "your" body is automatically yours if it is "blue" quality or below. Any BoP (Bind on Pickup) Epic items will be dealt with via the Master Looter system, which means that everyone will get the opportunity to inspect the item, but only those who can actually use the item are able to roll for it. The Loot Master will link any loot available to be rolled for in raid chat. S(he) will then invite any "Need" rolls first. To qualify to roll under a "Need" roll, the item must be for your current class and role - if you are unsure, feel free to ask. If multiple people roll "Need" on an item, highest roll wins. For further information regarding qualifying for loot, please refer to the item "Qualifying for Loot" below. If no-one desires an item under the "Need" roll, the Loot Master will ask for "Greed" rolls. To qualify to roll under a "Greed" roll, you must be able to use the item for an "off-spec" (ie, a role that you have set as your second talent tree). You should not roll under "Greed" for an item that you could use, but that you haven't specced for, unless all others who would qualify pass on the item. So, for example, if you are a Paladin healer, with an offspec talented into Retribution (melee dps), you should not roll for tank items, as you do not have a tank spec currently. If no-one desires an item under the "Need" or "Greed" rolls, and you wish an item to build up a set that you haven't currently specced for, please ask once it is obvious that no-one else is going to roll. If no-one wants an item, it will be disenchanted at the time of the drop and the resultant shard, etc, will be placed in the Guild Vault. Enchanting mats placed in the Guild Vault may be used to either level up enchanting or help enchant a piece of your own equipment. Please do not be greedy and take more than is necessary. Should an item drop that is Bind on Equip, the same rules apply as for BoP items in respect of "need" and "greed" rolling. If someone wins on a "Need/current spec" or "Greed/off-spec" roll they MUST equip it immediately, in order to make the item "soulbound". Once they have made the item soulbound, they do not necessarily have to keep wearing the item (ie, if it was won for an off-spec set). If no-one wants a BoE item to equip and use, the Loot Master may choose whether or not everyone should roll (highest roll wins) or if the item should be sold and proceeds donated to the guild vault. - be in the role the item is intended for DURING THE FIGHT THAT RESULTED IN THE LOOT DROP. Therefore if you were in a tanking role during that particular fight, you can ONLY roll "Need" for tanking items. If you were in a healing role during that particular fight, you can ONLY roll "Need" for healing items, etc. Regardless of any other roles you can or have in the past fulfilled. - ensure the item dropped is an upgrade to your current gear for that particular item slot. - ensure the item dropped is intended for your role, and not more suited to another role. - have an off-spec set up for the role the item is intended for. Therefore, if you were a DPS during the fight, and a healer item dropped that no-one rolled for under "Need", you can ONLY roll "Greed" if you were able to swap immediately from DPS to healer spec (although your off-spec doesn't necessarily have to be up to the same (raiding) standard as your main spec gear). - ensure the item dropped is an upgrade to your current (off-spec) gear for that particular item slot. - ensure the item dropped is intended for your (off-spec) role, and not more suited to another role. This is to ensure that (a) every member of the raid, at any one time, only qualifies for "Need" loot for one role, (b) those who are called upon to switch to a different role have a higher chance to gain loot for that second role, whilst using that role. This makes it fair to all members of the raid, and also enables those who dual spec to improve their "off-spec" faster than they normally would (as they may roll "Need" for items for that "off-spec" role, whilst in that role). Teamspeak is required in order to raid with us. We have a NPL Teamspeak server that is to be used for guild events only. Some leeway will be given to new members, to give them time to get the software and hardware required (the software is a free download, easily set up, the hardware involves either just a set of speakers, or headphones/mic - easily acquired for very little outlay). We use Teamspeak in order to discuss strategies before, during and after various raid encounters, together with discussing loot distribution, etc. Instructions on how to download and set up voice chat can be found on our site, but can only be accessed once you are a member of the guild and website (and you are logged in!). When strategy is being explained over Teamspeak, we expect other members to be silent in order for everyone to hear. Should you have a question, or wish to change part of the strategy, please wait until the end of the explanation. During a boss fight, please keep chat to a minimum - strategies may need to be amended during a fight, notifications given, and they must be able to be heard. Please be aware that our guild is made up of members from many countries - please try to ensure that you have a good connection and speak clearly in order for others to understand you. If you cannot understand something that has been said, please ask for it to be repeated - it's always better to ask for clarification than wiping because you didn't understand. If you don't understand then please ask for it to be typed for clarification. For any instance/party groups outside of the usual raid environment, unless otherwise stated (prior to the start of the run! ), the normal Blizzard Group Loot system will be used. This means that for every item that is "green" quality or higher, everyone will automatically be asked to either pass, disenchant (if there is an enchanter in the group) greed or need. If the option is available, the party leader also has the option to change to "Personal Loot". Current level instances, when you are given the options to need/greed/disenchant - only "Need" if it is an upgrade in your current spec. If no-one wants it as an upgrade for current spec, then off-spec can be rolled for under the "Need" option. If it isn't needed for either spec, then party members are free to either greed, disenchant or pass. If an item is Bind on Equip, the winning player rolling "Need" MUST be able to equip/use the item immediately, unless otherwise agreed by the remaining party members (for example if it a higher level than them). Loot from low level raids, unless someone is specifically wanting to run the raid in order to gear up a low level character, is generally for either recipes/patterns or for transmogrification gear (in respect of loot). Any recipes/patterns should only be rolled "Need" if you can actually learn the pattern with that attending character. If the pattern is BoE and no-one present needs for a current attending character, they can agree to roll "Need" for alts not in the group (but still in the guild). Greed rolls would be for either adding to the guild vault or resale value. Any gear that drops may be "Need" rolled if you can and want to use it for transmogrification.